Oceania (2 countries): Australia and New Zealand. Data cover production, consumption, imports, exports for 2015 and consumption forecasts for 2016, 2017 and 2018. Main urban markets (urbanization will be rapid, with important implications for the growth of furniture consumption). Country rankings to place all statistics in a broad Asia Pacific context. Internet users and mobile cellular subscriptions. - Basic economic data on countries of Asia and Pacific. 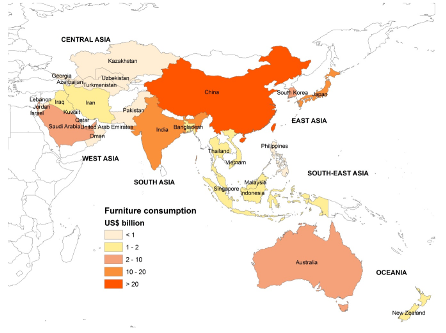 - Overview of the furniture sector in Asia and Pacific.